We will have to generate a YAML configuration file for configuring the 3D sensors. Please see this example file for processing point clouds. sensor_plugin: The name of the plugin that we are using. 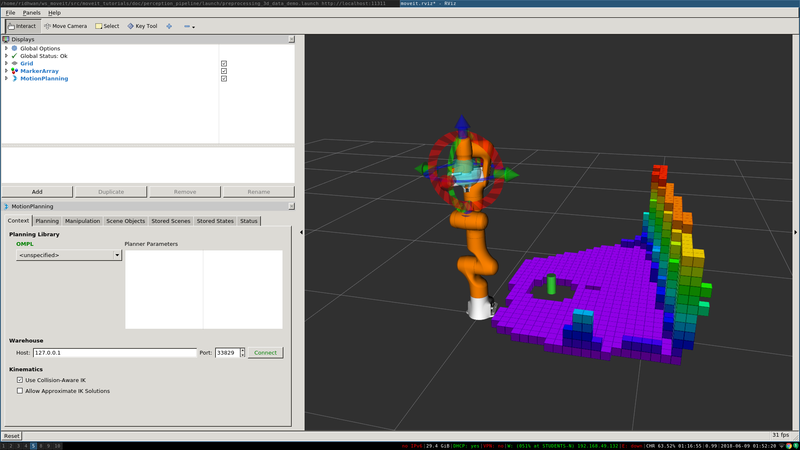 max_update_rate: The octomap representation will be updated at rate less than or equal to this value. point_cloud_topic: This specifies the topic to listen on for a point cloud. max_range: (in m) Points further than this will not be used. point_subsample: Choose one of every point_subsample points. padding_offset: The size of the padding (in cm). padding_scale: The scale of the padding. filtered_cloud_topic: The topic on which the filtered cloud will be published (mainly for debugging). The filtering cloud is the resultant cloud after self-filtering has been performed. image_topic: This specifies the topic to listen on for a depth image. queue_size: The number of images to queue up. near_clipping_plane_distance: The minimum distance before lack of visibility. far_clipping_plane_distance: The maximum distance before lack of visibility. If you are using depthmap change the name of the yaml file to sensors_kinect_depthmap.yaml. Note that you will need to input the path to the right file you have created above. octomap_frame: specifies the coordinate frame in which this representation will be stored. 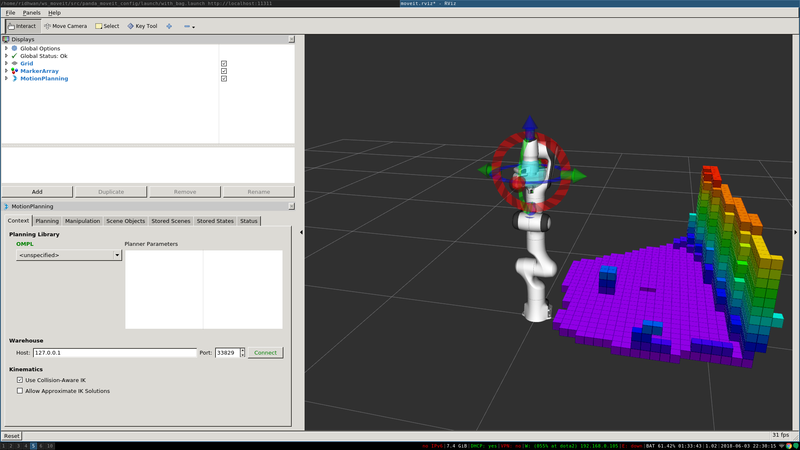 If you are working with a mobile robot, this frame should be a fixed frame in the world. octomap_resolution: specifies the resolution at which this representation is maintained (in meters). max_range: specifies the maximum range value to be applied for any sensor input to this node. If you set the initial and the final location of the robot in a way that there is no straight path between them, then the planner will automatically avoid the octomap and plan around it. you should see something like the image shown at the beginning of this tutorial. In this section, we will demonstrate an example of extracting a cylinder from a pointcloud, computing relevant values and adding it as a collision object to the planning scene. We will be working with point clouds but it can be implemented similarly with depth maps. ros.moveit_ros_perception: Transform cache was not updated. Self-filtering may fail. The details regarding the implementation of each of the perception pipeline function have been omitted in this tutorial as they are well documented here. First, convert from sensor_msgs to pcl::PointXYZRGB which is needed for most of the processing. Using passthough filter to get region of interest. A passthrough filter just eliminates the point cloud values which do not lie in the user specified range. Declare normals and call function to compute point normals. inliers_plane will hold the indices of the point cloud that correspond to a plane. Detect and eliminate the plane on which the cylinder is kept to ease the process of finding the cylinder. We had calculated the point normals in a previous call to computeNormals, now we will be extracting the normals that correspond to the plane on which cylinder lies. It will be used to extract the cylinder. ModelCoefficients will hold the parameters using which we can define a cylinder of infinite length. It has a public attribute values of type std::vector< float >. Values[0-2] hold a point on the center line of the cylinder. Values[3-5] hold direction vector of the z-axis. Values is the radius of the cylinder. The information that we have in coefficients_cylinder is not enough to define our cylinder. It does not have the actual location of the cylinder nor the actual height. We define a struct to hold the parameters that are actually needed for defining a collision object completely. There are 4 fields and a total of 7 parameters used to define this. Declare a variable of type AddCylinderParams and store relevant values from ModelCoefficients. Consider a point inside the point cloud and imagine that point is formed on a XY plane where the perpendicular distance from the plane to the camera is Z. The perpendicular drawn from the camera to the plane hits at center of the XY plane. We have the x and y coordinate of the point which is formed on the XY plane. X is the horizontal axis and Y is the vertical axis. C is the center of the plane which is Z meter away from the center of camera and A is any point on the plane. Now we know Z is the perpendicular distance from the point to the camera. Loop over the entire pointcloud. Use the parameters extracted to add the cylinder to the planning scene as a collision object. Define a cylinder which will be added to the world. Define a pose for the cylinder (specified relative to frame_id). Setting the position of cylinder.